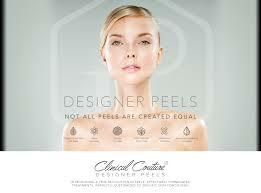 We are proud to announce a world renowned designer custom chemical peels. These highly effective peels are based on a series of six for maximum results, but if you just need a skin refresher try our introductory peel. Please read below for more information about each of the peels that we offer. 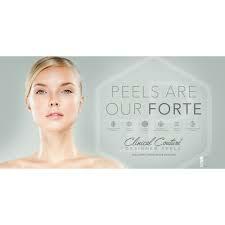 All chemical peels include a facial, total time for all peels is 30 minutes. 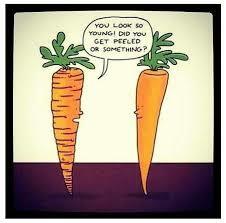 Organic Ingredients with medical effectiveness work to rebalance skin. A blend of pumpkin, pineapple, papaya and mango fruit enzymes and peptides in an organic aloe vera base; this non chemical peel rebalances, regenerates and restores skin while comfrey plant derived stem cell technology recharge your skin's stem cells helping maintain youthfulness of skin. Results-driven Vitamin C and enzyme peel to treat all skin types, including sensitive and redness prone skin. New technology of centella stem cells support redness prone skin and botanical detoxifying and energizing complexes give noticeable results in just one session. Uneven complexions have met their match. This results-driven treatment combines the most innovative and effective botanical brightens luminescent and seashore with echinacea plant-derived stem cells and anti-aging peptides immediately leaving the skin younger looking and luminous.. This ultra-resurfacing blend of glycol acid and retinol visibly reduces the appearance of fine lines and wrinkles leaving skin firm and revitalized. Buddleja stem cells reduce inflammation and diminish photo-aging, botanical coffee and peppermint energize, while eucalyptus and ylang ylang purify the skin. A potent blend of alpha and beta hydroxy acids blended with lilac plant-derived stem cells to reduce blemishes, redness and diminish post-breakout dark spots. Detoxifying ylang ylang and eucalyptus purify oily skin and help to effectively treat and heal acne blemishes. We are very competitive with our rates because we believe in taking care of yourself should not cost a fortune.